Grilled wild cedar plank salmon with fresh herbs topped with tomatoes, kalamata olives and red onion. 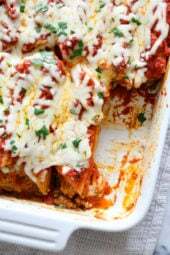 This is so flavorful, and simple to make, perfect for weeknight cooking or fancy enough to serve if you’re having guests. 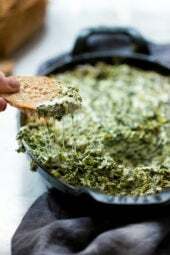 Aside from soaking the plank in water, the rest takes under 30 minutes to make. 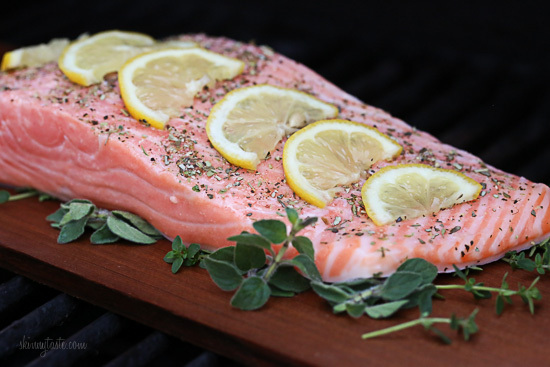 Grilling wild salmon on a cedar plank is easy to do, once you know how. I’ve learned a lot from my mistakes, so I am here to share what I learned. Soak the planks at least 1 hour. Turn the left two burners of the grill on so you’ll have indirect heat on the right side and direct heat on the left, then close the lid. You’ll want the grill to get very hot. Because the smoke is what gives you such great flavor, I place the plank with the fish on the direct heat side for about 3 to 4 minutes, until it starts crackling and smoking, keeping a close eye on it and a water bottle handy just in case. Then I move it to the indirect heat side, close the lid and let the heat finish cooking the salmon. The results are perfectly cooked juicy salmon, with just enough smoky flavor and no fire! A few more tips, I added fresh herbs from my garden to the plank before I put the fish on it to add more flavor as it cooks. My friend Joey also suggested soaking the planks in apple juice, cranberry juice or even wine. All things I plan on experimenting with in the future but for this recipe I went with water. If you have any tips to add to this, I’d love to hear it! Soak cedar plank in water 1 hour. Slice 1/2 of the lemon into thin slices. Season fish with remaining juice from 1/2 lemon, salt, oregano and black pepper . Cover with refrigerate until ready to grill. 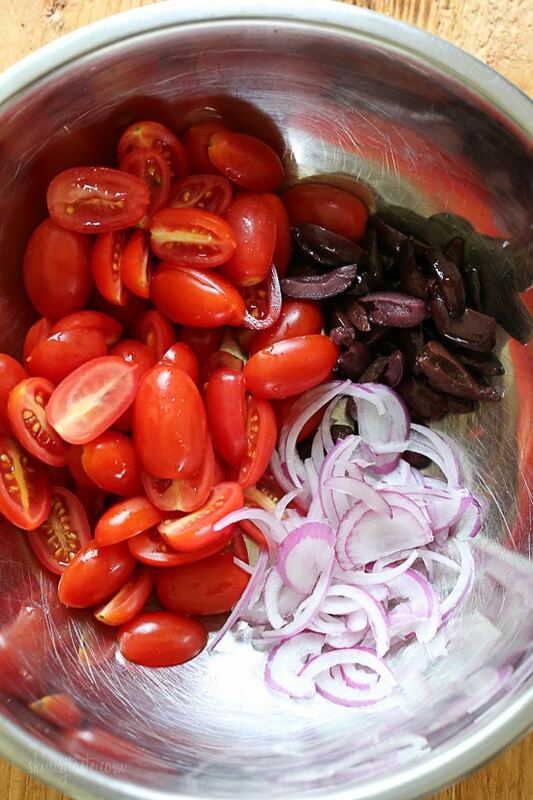 In a medium bowl combine the tomatoes, red onion, olives, olive oil, vinegar, salt and pepper. 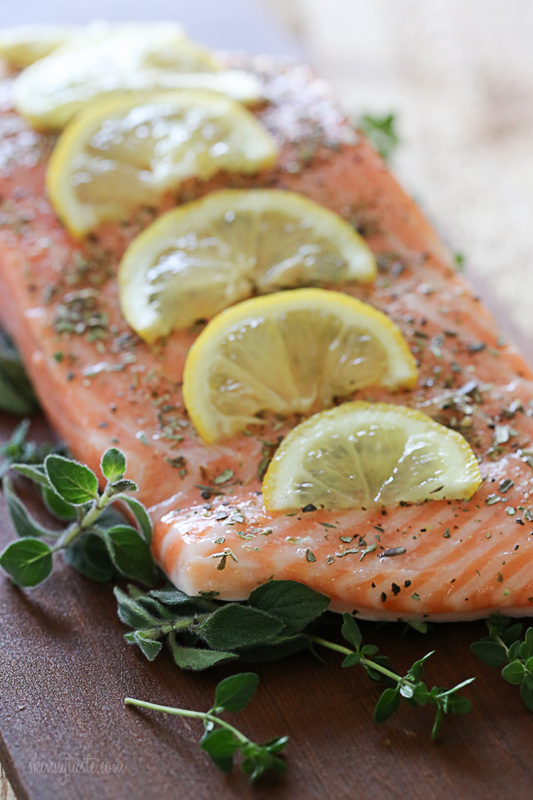 Place fresh herbs and salmon, skin side down, on the plank. Top with lemon slices. Heat the grill to medium-high, leaving the right burners off so you have indirect heat. Close the lid and let the grill get hot. Place planked salmon on the direct heat side for 3 to 4 minutes, until the planks start to smoke and get a little charred on the bottom and edges, (check occasionally to make sure edges of plank don’t ignite, keep a spray bottle with water handy if they do). Transfer the plank to the indirect heat side, cover, and grill 12 to 15 minutes depending on the thickness, or until the salmon is cooked through in the thickest part (I used a fork to take a peak). When the fish is cooked, top with tomato mixture and serve. I have just started eating salmon and the skin grosses me out. I usually ask the store to remove it for me, but for this method is it necessary to have it on? If so, do you remove it before eating? Do serve a side dish also? I had such bad luck my first time around, I didn't fully submerge the plank and when it came time to grill it caught on fire. Can't wait to give it another shot with this recipe. Ah yes, put something heavy on it like a glass to make sure its submerged under water. My first attempt was a disaster, too. I ended up soaking the plank for 24 hours because we didn't grill the day I started soaking. I think the plank was too wet and the salmon was a disaster. Thanks for posting better instructions. I love the idea of herbs under the fish. Last summer I bought a pack of 4 cedar planks at Wegman's and decided to finally try making my own grilled salmon. The instructions said to soak the planks for 30 minutes and then cook over high heat. I soaked my planks for 2 full hours. And like you, 5 minutes into cooking they were on fire. I was cooking 4 individual portions (they were small planks) and I was inside the house getting my side dish together when my brother-in-law told me there were flames coming out of the grill. Both my planks AND my salmon were ash by the time I got the fire put out 🙁 I've been terrified to try it again, but now I might since you were kind enough to post how to really do it! Yes, exactly what happened to me. The instructions on the planks and many recipes are wrong. This method works, I promise! You know, Gina, I shop at Wegmans and they have all sorts of interesting things to try. The cedar plank is one of them. I haven't bought one yet but I had imagined ME setting it on fire! LOL Guess I was right, huh! I love salmon because it's healthy and full of healthy fats. Although the flavor really depends on how you cook it. So I'm going to try this recipe. 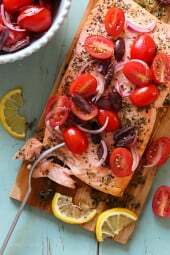 Salmon and tomatoes is one of my favorite combinations – this looks soooo good! Come see my 4th of July ready looks! can you use with different fish? salmon is my least favorite, how about cod or bluefish? any suggestions? This is probably a dumb question but why not put the vegetables on before you grill the salmon? I set my Kamado up for direct heat but light the full bowl of charcoal to one side and bring it up to around 400F. The coals tend to stay on the lit side for a while so you can slide the plank to the other side to be more indirect after the first few minutes about the lit side. QUESTION: We have a big green egg (ceramic lump charcoal cooker) I can not shut one side down like a gas grill, but I can do a set up that is indirect cooking the entire time. Should I do the indirect cook the whole time or direct cook whole time, not able to easily switch back and forth like on a gas grill. 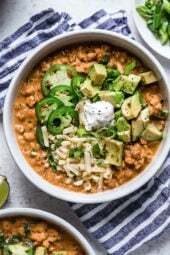 Would love to try this tonight, BF would love this:) Thank you for any feedback!! I would do indirect heat the whole time since you can't control it, and keep a water bottle handy! This looks great! I've been meaning to try cedar plank salmon for quite a while so this is the perfect opportunity to give it a shot!